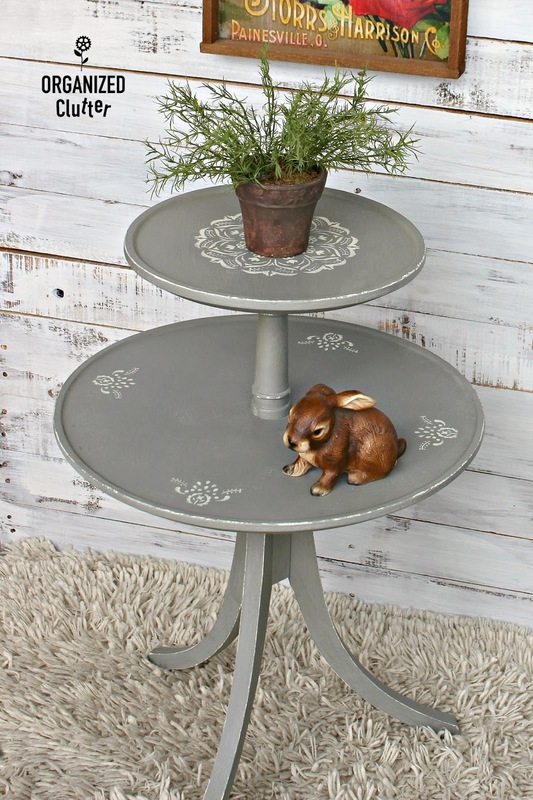 I found this sweet little two tiered table at the thrift shop last week. It has some water damage and the top tier was a little warped but it had possibilities. It was made by Mersman, a midcentury table company. 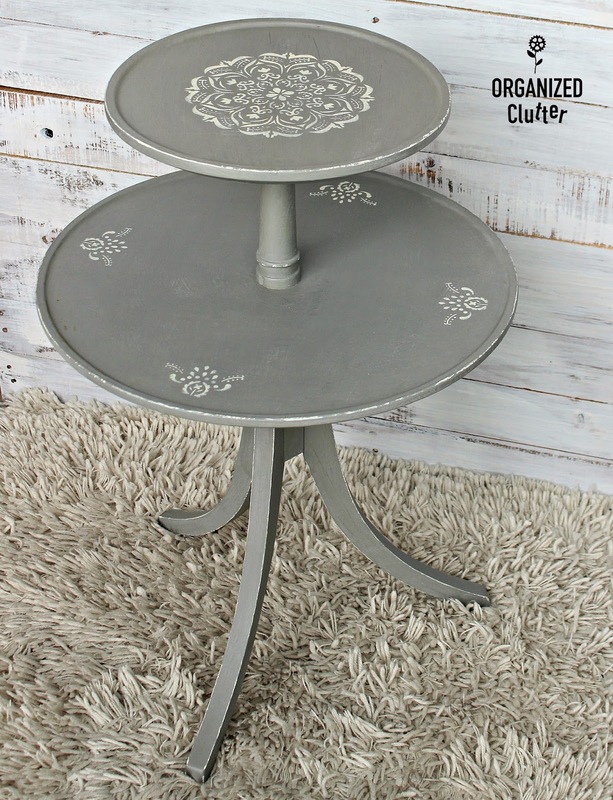 First, I painted the table with two coats of Rust-Oleum Chalked Paint in Country Gray . I then stenciled the table with my new Mandala stencil from Hobby Lobby. The stencil only cost me $2.99. I used the larger center Mandala design for the top tier and the corner stencils in four spots equidistant from the center on the bottom tier. I stenciled the designs with Delta Ceramcoat Acrylic Paint in Light Ivory . This is my go to color for white or light stenciling. Then I used my FolkArt Layering Block with the light ivory craft paint to faux distress the edges of the table. I have never used any craft paint but Ceramcoat Walnut Noyer to faux distress with my layering block. I like the new effect with light ivory paint. I brushed on one coat of Rust-Oleum Matte Interior Chalked Sealer to protect the chalk paint finish and stenciling on my table. A great $10 thrift shop investment! This turned out so cute! My grandfather used to be a salesman for Mersman furniture back in the 50's. This is adorable! What did you do about the warping & the water damage? Just paint over it? I didn't see where you said what you did. Another great find and salvage! I always love your stencil projects. Carlene, I have a table just like that and I've been wondering what to do to it! I really like the way yours turned out. I might just copy what you did!